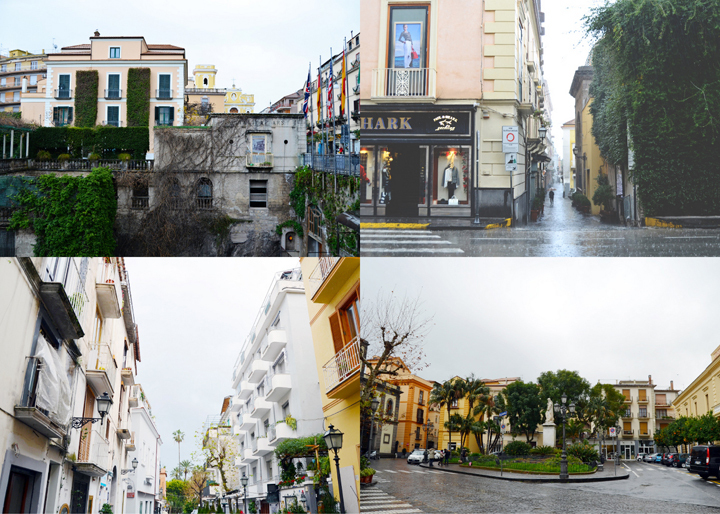 Before we got to the Amalfi Coast proper we decided to explore Sorrento. 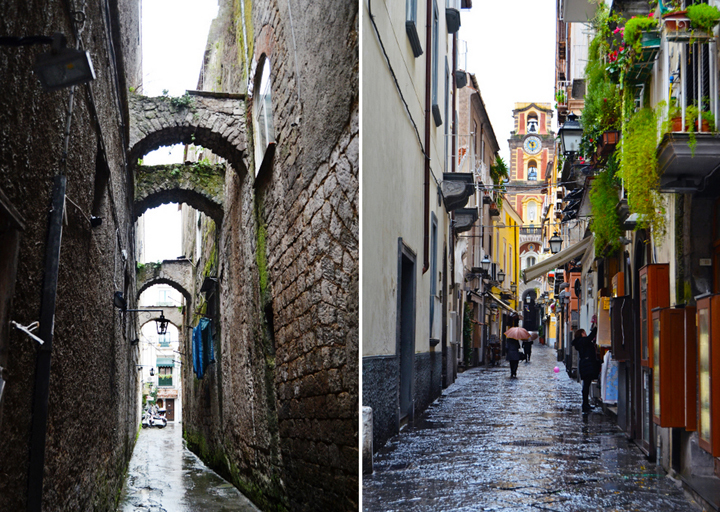 Wedged on a ledge under the mountains and over the Mediterranean, spritzed by lemon and olive groves, Sorrento is an attractive resort of 20,000 residents, and in the summer, just as many tourists... This gateway to the Amalfi Coast has an unspoiled old quarter, a lively main shopping street, and a spectacular cliffside setting. 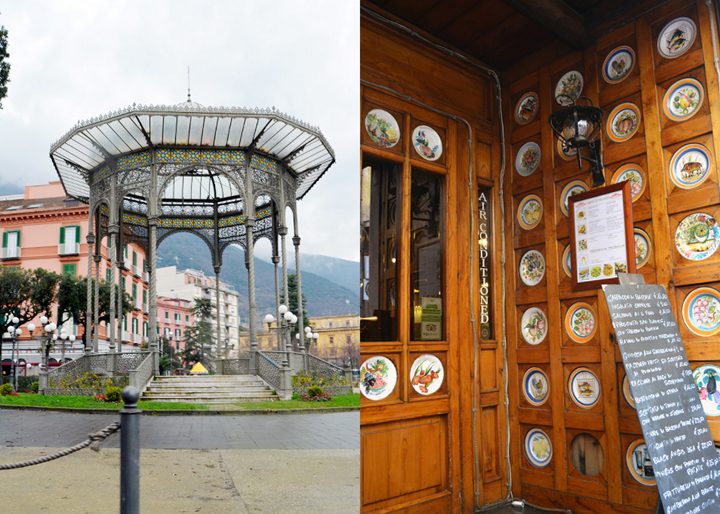 We found a parking garage near the main square, Piazza Tasso, and got started on our Rick Steves' walk. They still had the Christmas tree up, lol. A statue of St. Anthony, patron saint of Sorrento, faces north as if greeting those coming from Naples (like us!). The square spans a gorge that divided the town until the 19th century. The old town even still has some surviving ancient Greek streets. The most expensive apartments and top cafes surround the piazza. At this point it started pouring down rain, but we had the stroller cover and umbrella so we trudged along. A statue of Torquato Tasso, the square's namesake, a Sorrento native, he was a lively Renaissance poet. Leaving the square we headed down Via Santa Maria della Pieta. The history of this street goes back centuries before Christ. The lane lead us right in front of the cathedral. Very cool and serene inside the church. The doors were made to celebrate the Pope's visit in 1992. Something about a palace and a shrine... I'll have to look it up later. Large and lovely gazebo and plates that I want one of each of. We eventually wandered out to the cliffside square of Villa Comunale with gorgeous views of the harbor and Gulf of Naples. The Evans Family in Sorrento, Italy. Tyrrhenian Sea. Colorful and playful tiles. Back near Piazzo Tasso we headed inland to take a look at the gorge that used to separate the two parts of what is now Sorrento. The steps carved along the cliff wall in the left side of the picture date to the fifth century. B.C! Looks straight out of The Hobbit or something! Beautiful Sorrento! | A statue of St. Francis. I loved this bright yellow church with decorative details. Walking back to the parking garage, looking up at a colorful building. Thanks, Sorrento! You were great! 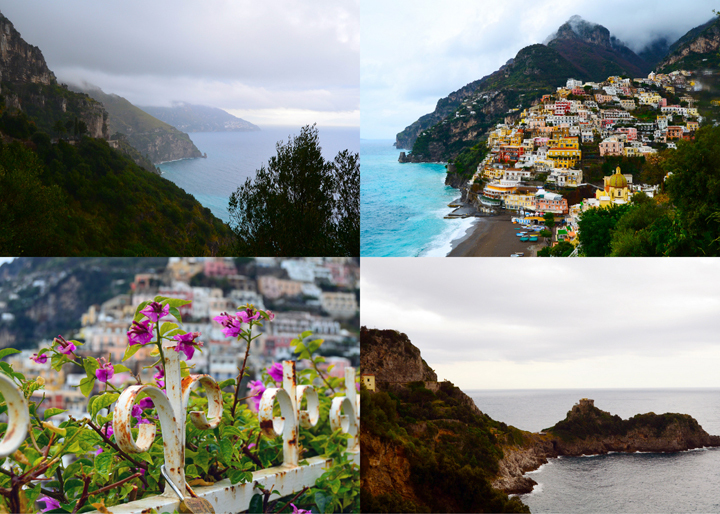 But I was itching to see the legendary Positano, so we loaded back up in our rental car and crossed the little peninsula to the Amalfi Coast. 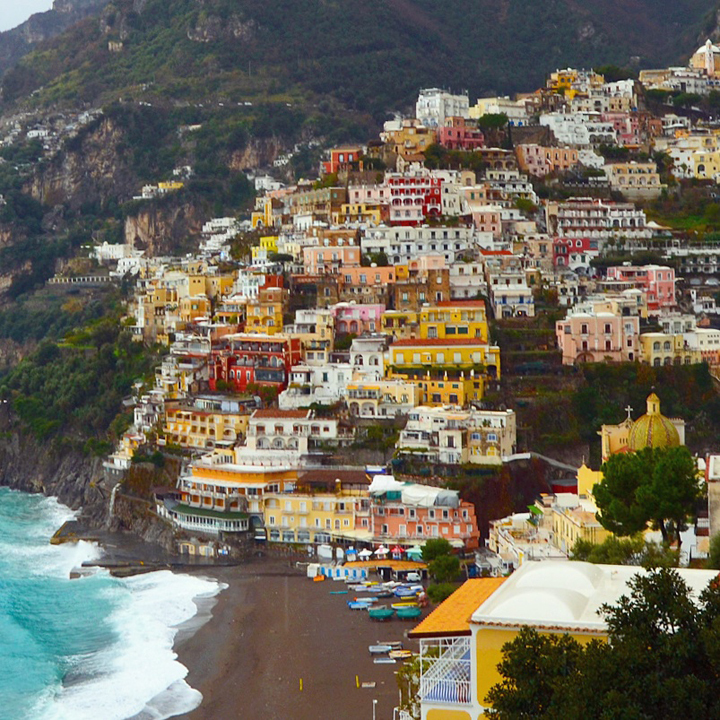 With its stunning scenery, hill-and harbor-hugging towns, and historic ruins, Amalfi is Italy's "coast with the most." The drive from Sorrento to Salerno along the breathtaking coastline is one of the world's great scenic drives. Even though it was a little overcast, the scenery was jaw-dropping. Looking back at Naples with Vesuvius looming in the background, and a bit of rainbow. Picture perfect! I made Chris stop every time I spied something worth photographing. Since there weren't any cars behind us, I didn't feel too bad parking in the middle of the road. But during the summer, we've read and heard this road is stop-and-go the entire drive. Our first stop: Positano! According to legend the Greek god Poseidon created Positano for Pasitea, a nymph he lusted after. History says the town was founded when ancient Greeks at Paestum decided to move out of the swamp to escape the malaria carried by its mosquitoes. We drove through the town the one direction you can on the teeny tiny itsy bitsy road to find the lookout. Found it! Be still my heart! Goodness gracious, could this town BE any more scenic? The colors! The layers! And how do they build up on the hill like that? The Evans family in Positano on Sunday January 18th 2015. The rest of the drive was absolutely nauseating, albeit breathtaking. Even Jane was about to upchuck and she's never once had carsickness. But. It was lovely nonetheless and I'm glad we did it! So gorgeous! Those houses on the hills are WOW!!!! Wowza! That's amazing! Even though it was raining and cloudy, it's better than lots and lots of traffic. What amazing photos! Beautiful!! I love those colorful buildings!! I love reading your travel recaps! Aw, I was looking forward to this post ever since your instagram picture! I've seen this place all over Pinterest too. SO BEAUTIFUL!! BEAUTIFUL pictures--I'm seriously loving the colorful houses and views!